Peel the corn and keep the husks aside. Cut the corn off of the cob into a large bowl. 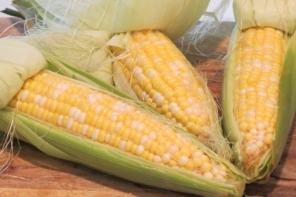 Place the corn into a blender or food processor by batches. Add a little milk – and I mean a little milk – to blend the corn until it is smooth and milky. Empty into a large bowl. Add the rest of the ingredients and mix well. Place the humintas in a double boiler – or a pot with very little water – and add an extra teaspoon of aniseseed on top. Steam them for 30 to 35 minutes. Serve with a nice cup of coffee or for lunch with a side salad. Enjoy!